The drives need a free PCI or PCIe slot. The PCMCIA Drive and the ExpressCard Drive require additionally a free 3.5’’ drive slot in the PC housing. The Vector PCMCIA and CardBus Drive include the PCI CardBus controller chip 1420. This enables either the simultaneous operation of two 8 or 16 bit compatible PCMCIA cards of type I or type II or the operation of one PCMCIA card of type III. 32 bit CardBus cards are only supported by the Vector CardBus Drive. 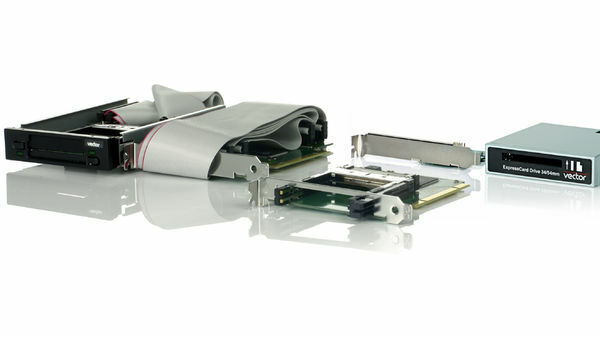 The Vector ExpressCard drive supports data transfer rates of up to 5 Gbit/s. With this drive it is possible to operate cards according to ExpressCard standard with 34 mm and 54 mm size. Dependent on the desktop PC the drive supports the Hot Swap functionality. The drive needs no additional driver. Combining Vector software tools, PC cards (e.g. CANcardXL), the Vector Drives, and a desktop PC, the user gets a professional system for measurement, analysis, and emulation. The drives include two independent PCMCIA slots. As the slots have voltage identification, the PCMCIA cards can be used with a supply voltage of 3.3 V as well as 5 V. The PCI plug-in card is compatible with PCI 2.2. The drive includes one ExpressCard slot. Please see also the Application Note "ExpressCard Hot-Plug".